NOTE: Try to avoid talking in your match. It messes up the replay. NOTE: This guide is only for Windows Computers. Step 1. Highlight the first letter of the code. Step 2. Use your scroll bar and scroll all the way down. Step 3. Hold the ''shift'' key on your keyboard, and click on the last letter of the replay code. Step 6. Hold the ''Ctrl'' key. on your keyboard, then hold the ''V'' key. 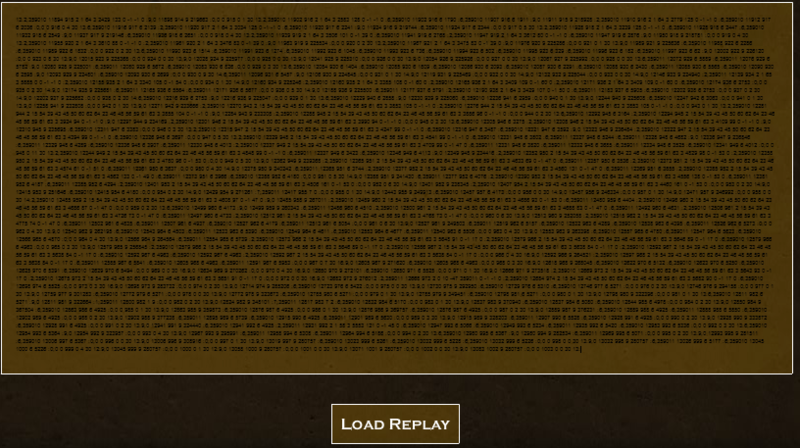 The code should now be pasted, and you now press the ''Load Replay'' button for the replay to be played. Last edited by m0ntana; 05-03-2014 at 01:21 PM. A note on replays that you should mention in your OP montana. Chatting during a game fks up with the replay. You'll notice in the coding, after each chat there is a huge space that needs to be removed. The best way for a replay to work is if both players have not chated. I quit. I freaking quit. Screw this 9.8 kb limit, it's impossible to get a good gif that size. Here's my freaking gif. Sorry for double posting, but here is my next replay :3 Note i had 1825 rating, other guy had 1900s +. I got 21 rating for winning lol. Last edited by DragonFrost; 01-19-2013 at 12:20 PM. Can someone tell me how to view replays. I followed the directions here. But it keeps saying that "It is an older version of Stick Empires and is no longer available"
In one of the patches they changed the replay code. Old replays no longer work. Ok, now it is saying that "The REplay code is broken or incomplete. Please ensure that you have copied it correctly." Last edited by StickWarrior14; 01-19-2013 at 06:13 PM.